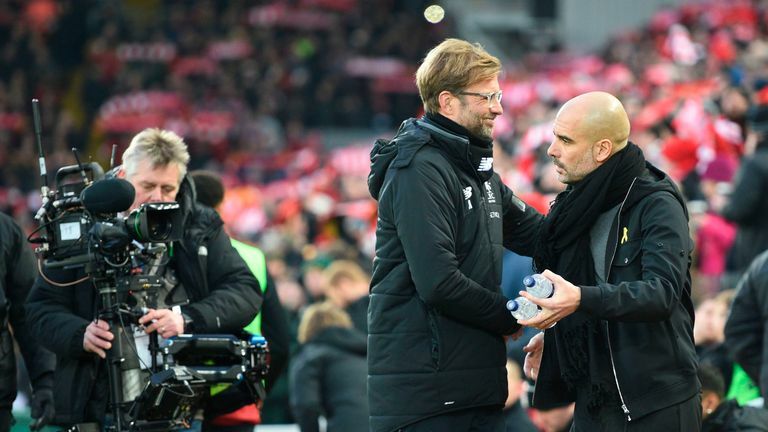 Pep Guardiola explains how Liverpool have evolved into 'maybe the best team in Europe or the world right now' under Jurgen Klopp. 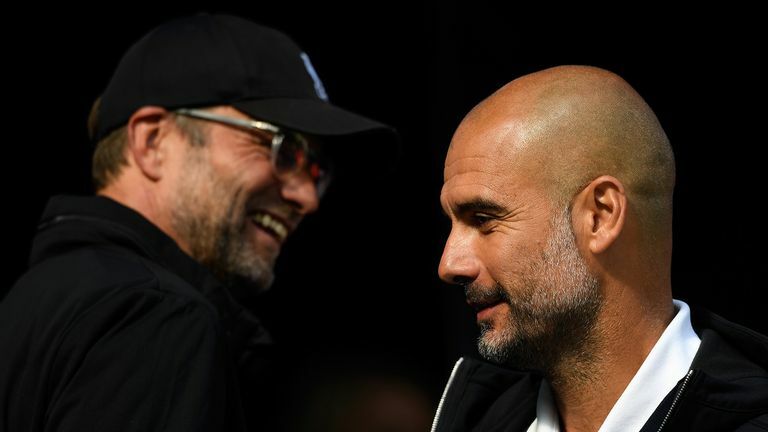 Manchester City manager Pep Guardiola believes Liverpool have evolved into a team capable of dominating all phases of the game under Jurgen Klopp. The Reds travel to the Etihad on Thursday night, live on Sky Sports, with a seven-point lead over City at the top of the Premier League, following a difficult December for Guardiola's side which saw them lose three league games. Liverpool, by contrast, have been in imperious form and remain undefeated in the Premier League. The additions of Virgil van Dijk, Alisson, Naby Keita, Fabinho and Xherdan Shaqiri over the past 12 months are paying dividends for Liverpool, and have prompted Guardiola to concede Liverpool are "maybe the best team in Europe or the world right now". 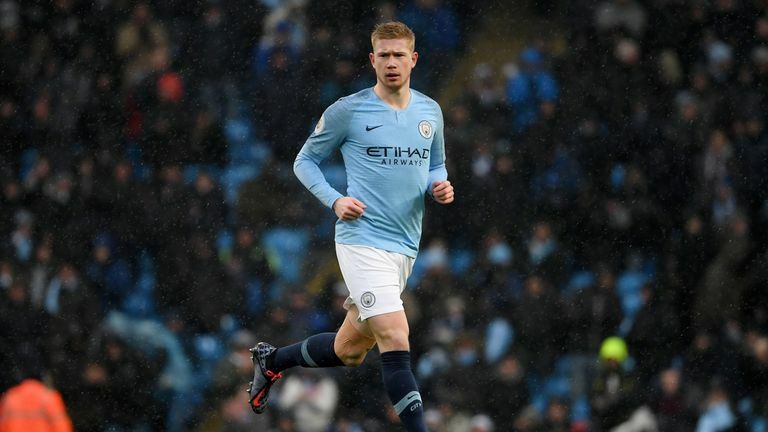 Jurgen Klopp is wary of the threat Kevin De Bruyne will pose to Liverpool if he returns for Manchester City in Thursday's match. Asked to explain that belief, Guardiola told Sky Sports: "They are solid in behind. In the positional game when the opponents defend deep they had problems attacking them but now they are able to attack them really well. "In the transition as always, they are so good. In the set-pieces they are a massive, tall team. "So it is a team that can control all areas. That is why I am saying what I am saying. "In front they play the same players, but in the middle they have changed a little and especially at the back. They have changed a lot of players at the back. "And they know each other better. They have had four or five seasons together." Liverpool manager Jurgen Klopp has called on his players to be brave against 'the best team in the world' when they play Manchester City on Thursday night. The respect between the sides appears to be mutual with Klopp saying on Wednesday that City are "still the best in the world", though Guardiola is taking that statement with a pinch of salt. "I don't know if [Klopp] believes that. I am pretty sure when I say they are. I don't know if he is saying that, with what is happening this season, just to be kind to us," Guardiola said. City shook off consecutive defeats to get their title challenge back on track with a 3-1 win against Southampton at St Mary's on Super Sunday. Afterwards Guardiola claimed nothing a less than a victory against Liverpool on Thursday would keep his side in the title race. 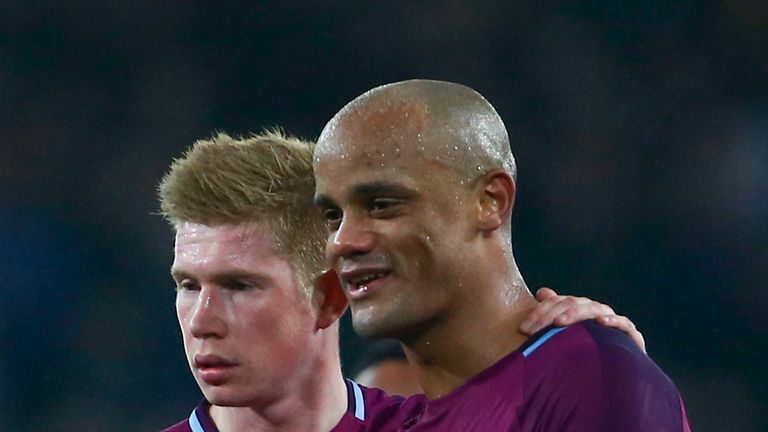 Vincent Kompany believes Kevin De Bruyne's long-term fitness is more important than his possible return against Liverpool. But the Spaniard has cautioned his side against focusing on Liverpool rather than themselves, as they adapt to being the hunter, rather than the hunted. "What you have to do is control yourselves," Guardiola continued. "The problem when you are behind, which in my career I was many times, is you just think about what is happening to the people in front of you and forget what you have to do. Transfer Talk: Pulisic the next Hazard? "That is a huge mistake. Once that happens, you cannot pick them up. It will be impossible. On Thursday we have an opportunity to win three points and not allow them to do it. "But after, if you think 'they have to lose in that game' and you go against any team and do not do your job, then you are over."